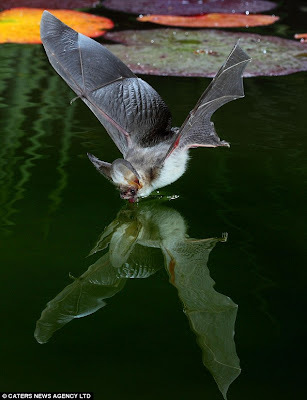 Ida sent in this great article featuring some amazing shots taken of bats skimming the surface of a pond for a quick drink in Surrey, UK. These photos got me thinking. Many of us humans have fears (often well justified) of both real and imagined horrors that live beneath the water's surface. 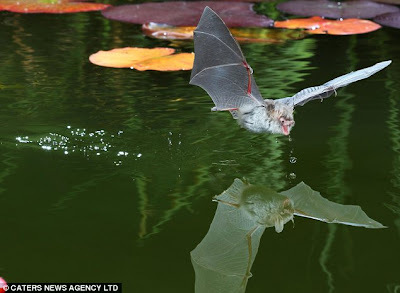 I wonder if aquatic beasts live in similar fear of the monsters that live above the water's surface. If so, then you'd best not show them these pictures. 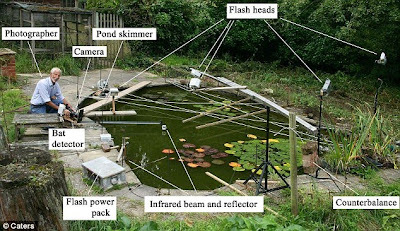 And if you were wondering how these photos were taken, go the article, then look at the last photo below. It's easy! All you need is fancy equipment and a lot of expertise and patience. That setup is nuts...but possibly not the nuttiest I've ever seen! This guy is just insane. Omg! some people have a passion and are willing to spend time, money, and effort on it! How horrible! they should be institutionalized! 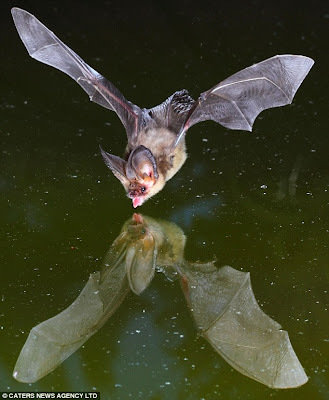 Merlin Tuttle, founder of Bats International, an organization devoted to preserving endangered bats and educating people about them, has done this type of photography for years. In fact, he pioneered the techniques in question. In other words, Merlin Tuttle, who just retired rocks.